Scientists have been studying DNA – the molecules that carry the genetic instructions used in growth, development, function and reproduction of all living organisms and many viruses – for decades. California State University, Northridge associate professor of physics Henk Postma and team of researchers at CSUN have been studying the way scientists examine DNA molecules — by passing a strand of DNA through microscopic gaps in a material called graphene — and these new CSUN findings could have implications on future research. Postma and his team found that serrated edges in the graphene gaps could change the way DNA passes through those holes. Postma headed a team of researchers that included Mark Raul, a mechanical engineering professor at Virginia Polytechnic Institute and CSUN graduate students Hiral N. Patel, Ian Carroll, Rodolfo Lopez, Jr., and Sandeep Sanakararaman, undergraduate Charles Etienne and Subba Ramaiah Kodigala, a former laboratory technition for Postma who is now a researcher at the University of Nevada. They published their results earlier this month in the Public Library of Science (PLoS) ONE journal, a peer-reviewed open access scientific journal. Postma explained that when scientists study a DNA sequence — or a strand of DNA — they are trying to understand the order of the chemical building blocks that make up a DNA molecule. During the process, an assumption is made that DNA molecules taken from the same specimen are all alike. Postma and his team tried to come up with a way to help scientists notice the differences between molecule by focusing on single-molecule sequencing, and in the process improve the way DNA molecules are examined. When scientists worked on the DNA of the human genome in the 1990s, Postma said, the DNA molecules were chopped up in little pieces with a size called the “read length,” and they were distributed to researchers around the world to analyze. The answers, for example, to some health questions cannot be found if you never look at the parts of the genome that have may repeats in them, Postma said. The way to get to the problematic parts is to give scientists access to longer read lengths of DNA, he said. Scientists would like to use graphene — a material made from honeycomb sheets of carbon just one atom thick — to examine DNA. As a DNA molecule passes through a tiny hole in the graphene, it interrupts currents of electrically charged particles — ions. 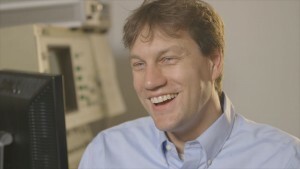 The data collected from these “blips,” as Postma called them, is registered as electronic waves on a computer, providing scientists with valuable information about the DNA molecule. Postma and his team saw these signals looked different than what was expected. They wondered if this could be because the graphene holes, which are microscopic in size, were not cleanly cut — but serrated. “The length of these events [passing through the holes of the graphene], then varies depending on where the molecule has to squeeze through the gap,” Postma said. In some instances — when the holes were particularly small — the molecule would pull the edges with it as it passed through. Once the molecule was clear, the graphene edge would retract to its original position, but at an unusually slow rate. What they discovered could have implications as equipment is developed to take DNA research becomes more precise.